Categories: Assisted Reproduction Technology, Infertility to Adoption, Tapestry Picks. Alphabet Blessings offers a practical look at the process of in vitro fertilization through explanation of testing, terminology and common lingo of the infertility community as well as factors affecting cycle outcome. 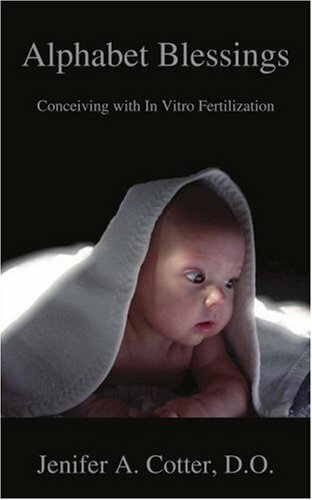 With an honest and open discussion on life as an infertile couple, this book validates the intense emotions most couples experience as they struggle alongside their fertile friends.Addressing the unique issues and stresses faced by both partners as they chase baby, Alphabet Blessings provides information, hints and thoughtful insight for all the phases of an in vitro fertilization cycle and strives to support couples as they undergo a very clinical and intrusive process.The sincere and positive tone of this book will empower each couple to face their fears regarding their diagnosis and treatment options and allow them to see IVF as a wonderful opportunity to achieve their dream of parenthood. Emphasizing the very human side of assisted reproductive technology, Alphabet Blessings seeks to light the path and guide the hearts of infertility couples the world over and provides a wonderful oasis of hope and inspiration along the path to parenthood via assisted conception.